Can I just take a second to tell you how much I love teaching? One of my very favorite things about teaching is thinking up activities that fit my student’s needs. 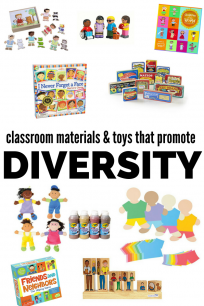 No activity is one size fits all so when I am putting out free choice literacy activities for preschool in the morning I have each student’s abilities and what they have been working on in the back of my head. For example, if you have a child who thrives with fine motor tray activities I would find a way to work in another area of learning they can work on using their strengths and interests. This is especially important for free choice because the children choose what to do, and children gravitate to things they are already good at and comfortable with. Use those strengths! In my 2 and 3-year-old class my literacy goals may look different than yours but playing with letters is one that fits into all preschool classrooms. The children’s specific abilities will take the general activities in slightly different directions but our invitations to learn can have the same base. 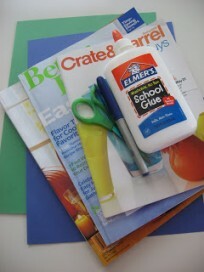 Here are 11 of my favorite literacy activities for the free choice time at preschool. If you are looking for even more resources and a place to chat about being a preschool teacher with other teachers check out my new Facebook group No Time For Flash Cards – Teacher Talk. 1. Letter cookie cutters in play dough. This is such an easy activity, but you can do so much with it. You can make letter cookies, make and squish letters, use the cookie cutters like stamps in big mounds of play dough… the sky is the limit. I like to sit down and look for “my letter” and casually ask the child next to me if they want their letter. This leads to finding other classmates letters usually or sometimes it falls flat, that’s OK don’t push. 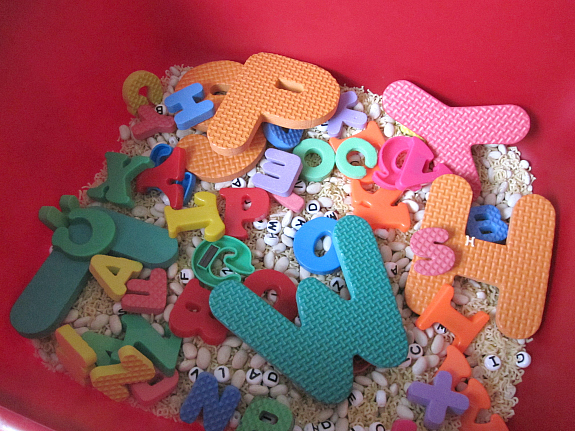 I love putting out my letter fish, but I have also found that these jar lid letters work beautifully for this activity. They are especially great for not so gentle toddler hands. 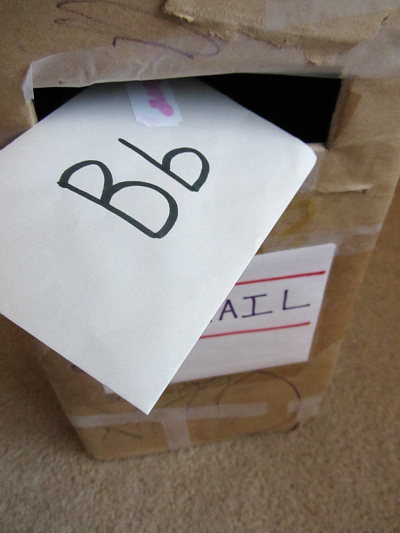 Make a mailbox from a cardboard box, grab some small envelopes and add letters to them. Children love feeding the mail into the mailbox. They can hand it out to classmates who can also pop it in the mailbox. This is always a huge hit and like all of these ideas don’t require a teacher to be present the whole time. If you are playing with students if the opportunity is right for you to take the lead you can label the letters as they put them into the mailbox, ask if they have a favorite letter, or ask if they want to hand them out to friends “Which letter should we give to Tommy? The J great!” resist the urge to quiz play. I know it’s hard, it’s so natural to say “What letter is that?” over and over. For beginners just let them work on beading, if they are interested in the letters they will start seeking out the letters they are familiar with. Comments like “This is my Mom’s letter!” and “Look a P!” is common around this type of activity. If you are teaching older children, feel free to give them the option to spell things like their names. 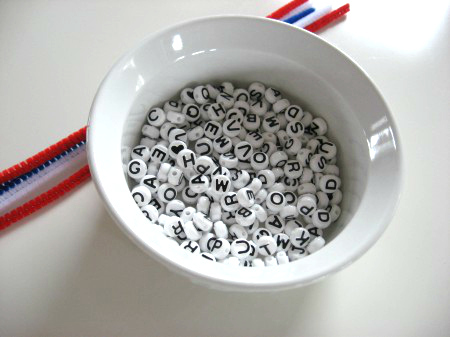 Once children are spelling with the beads you will need a few packs to ensure that you have enough letters for whatever they want to spell. 5. 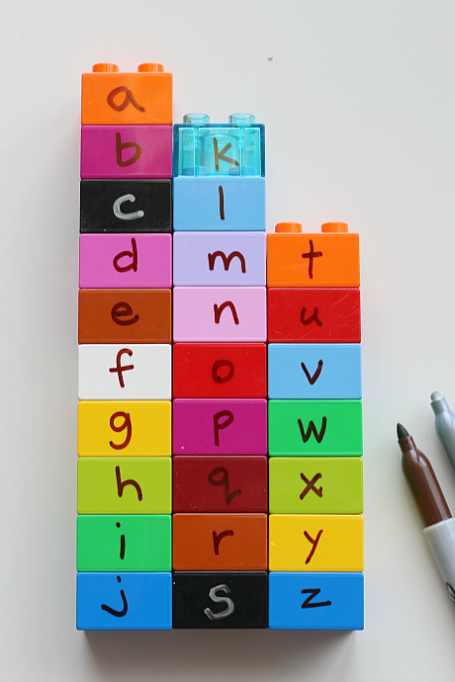 Building with alphabet blocks ( matching upper and lowercase too ). I LOVE using a marker on Duplo for this type of activity. I write out the alphabet at least twice once in upper and once in lowercase letters. Children can build, they can spell, make an alphabet tower, and they can match up the upper and lowercase letters. There is no wrong way to use these blocks. 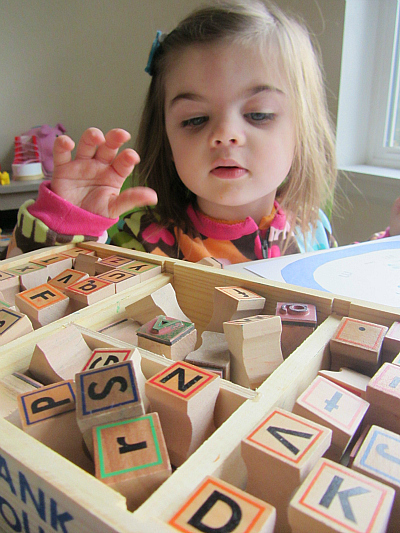 The child can choose to use the blocks based on their interests and abilities. What I love about free choice is that the child on the left of you can be spelling with these blocks while the one on the right could be building a tower without caring about the letters at all. They are both learning. 6. Letter stamps and paper. There is something so satisfying about banging a stamp down. 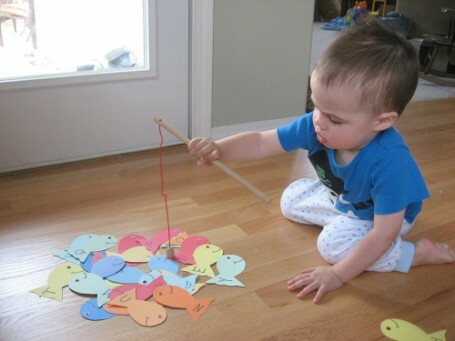 Using letter stamps gives children who aren’t able to write yet a way to make letters they can recognize. Fun colored ink pads take it from plain Jane to a fine art! Have you ever watched a child just fill and pour for ages in your sensory table? It always grabs my attention when a child carefully fills and pours over and over. They are making connections. Adding in letters is really just a fun way to discover them but no extra instruction is required. Let the children explore and discover with their hands! Stickers are always a hit and what I love about this activity is that it naturally works on fine motor skills as well as patience. 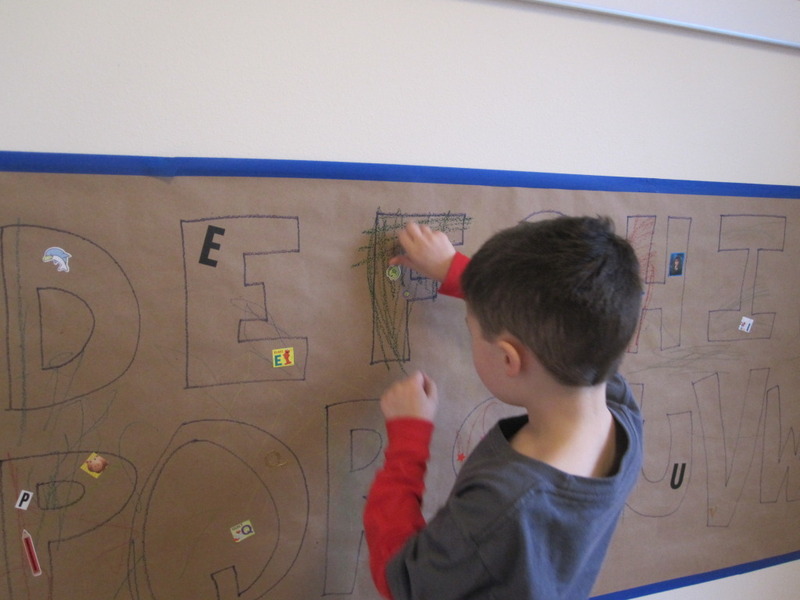 Peeling stickers off a sheet and putting them on a paper mural isn’t easy. You don’t don’t have to write out letters like I did in the photo above, I usually just pop up some paper and let the children go for it! When children are ready they can spell with the stickers, group them, and use the already stuck stickers for games like eye spy. I am always amazed at how these murals get used as children develop. 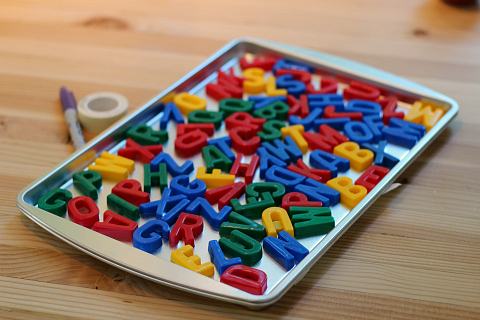 Alphabet magnets are a classic for a reason. 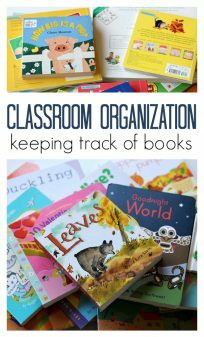 So many great idea for them (check out a post I wrote for Scholastic for more) but just having them out and available is great for free choice. I like to sort by color. Have them all up and ask students to go search for a specific color. I then label the letter, or sometimes I will spell out a name or two and see if anyone recognizes it. And if they do I spell a new one. But, if not, no worries the children find their own ways to play as well. Children love it when you mix two things they never thought to mix together. 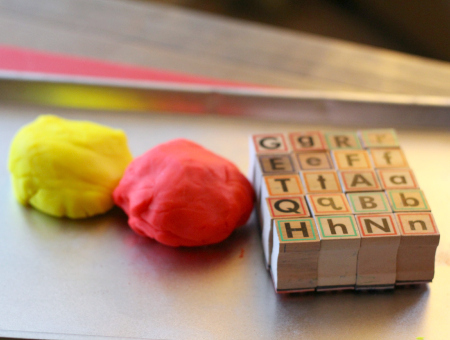 Letter stamps in play dough is a fun way to invite children to play with letters. 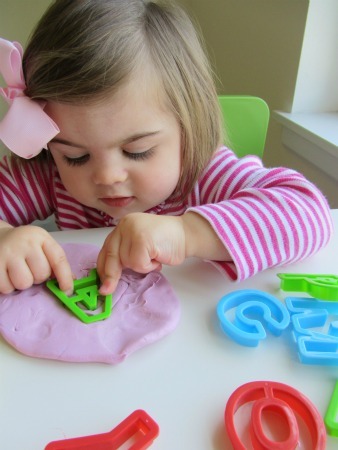 They can squish the letters into the playdough making fun marks, work on spelling their names, print the whole alphabet, or even hide the stamps in the playdough and then excavate them! A comfy place to read and some easily accessible books are a must for free choice. 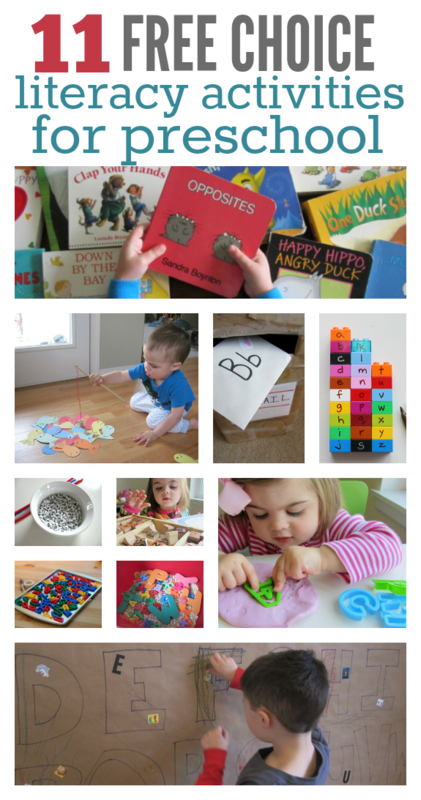 Want even MORE alphabet activities? Check out my list of 50 awesome alphabet activities by clicking on the image below or here. 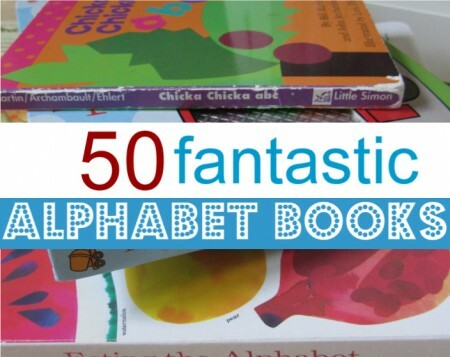 Need some alphabet books? We have 50! Click on the image below or here to be taken to the reviews. 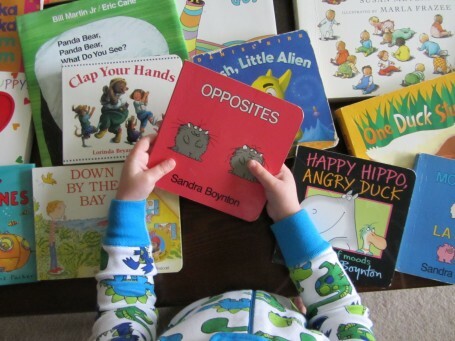 For other fun literacy activities for preschool aged kids, make sure to follow me over on Facebook! Previous Post: Water Table Activity – Make A Mess and Explore! 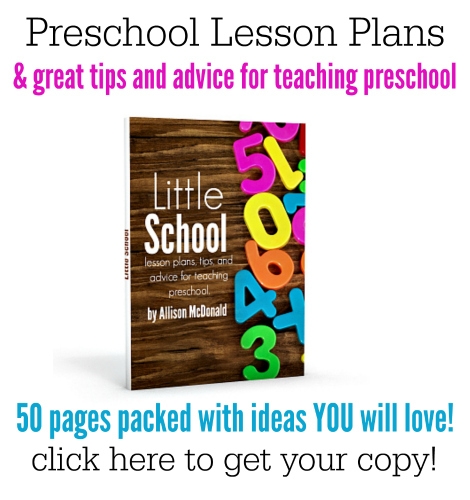 This is one of the BEST sites for early learning!!! Developmentally appropriate ideas, themes, and suggestions that I used even with second-grade kids!! I have taught for 28 years in elementary classrooms but I can recognize high quality work, thinking, and understanding of young children. You are so totally worth everybodyâ€™s time and attention, and I mean EVERYBODY!!! Thanks so much for your thoughtful and incisive ideas! !